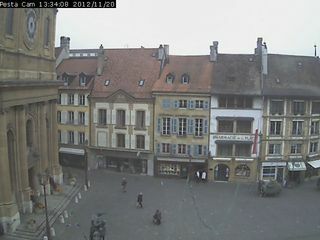 Webcam Yverdon-les-Bains: City View - A view of the town center of Yverdon. Yverdon-les-Bains: roundshot 225° Panorama City, 0 mi. Sainte-Croix VD: roundshot 360° Panorama Les Rasses, 6.9 mi. Buttes: roundshot 360° Panorama La Robella, 8 mi. La Praz: Weathercam La Praz, 12.8 mi. Villarzel: Station Météo de Villarzel, 13.1 mi. Vallorbe: roundshot 360° Panorama Vallorbe Commune, 13.3 mi. Les Taillères: 261° Panorama Lac des Taillères, 13.5 mi. This webcam Yverdon-les-Bains with the theme City Views was added on October 16, 2009 and is operated by Commune d'Yverdon-les-Bains. It got 4699 visitors since then. Shouldn't this webcam work or should the link be wrong please report that here. You can add this webcam here to myCams.